You can track your website visitors and chat with the visitors from anywhere and everywhere with SalesIQ mobile apps. SalesIQ has two different applications for your iPhone and Android mobile devices. Accept and Ignore chats from the notifications you get instead of going to the page. Change your status, mute/unmute, view connected and missed chats from the dock itself. Get your Mac, Windows and Ubuntu desktop app, right here. Note: The windows desktop application is available in the 64-bit operating system. How to view the recent request of a Visitor? Your Zoho SalesIQ will only work in conjunction with Jabber if you have a Zoho user name associated with the account you wish to use. 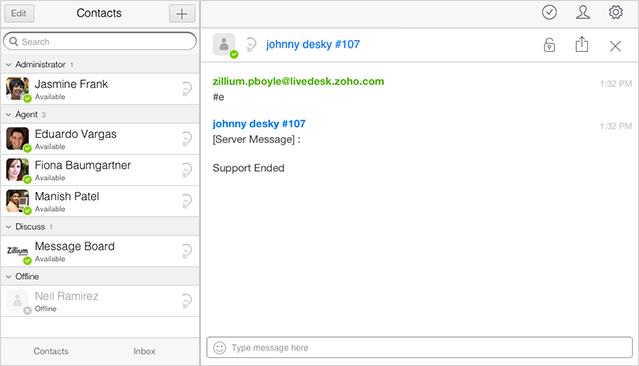 If you only have your login e-mail and not a Zoho user name, you will be unable to configure any device or app to connect to your Zoho SalesIQ through Jabber. To ensure your account has a Zoho user name and to correctly configure a Jabber client, check out the mobile configuration page. On here, click the red “View” button to see the Jabber configuration details for suggested mobile apps. This will also display your Zoho user name in the details of the app specific configuration. If you don’t have a user name configured, you will be prompted automatically by the system at this page to choose a user name. When you access the Jabber configuration page, the system will automatically search for your user name, and prompt you to create a new Zoho user name if you haven’t yet done so. Type your desired username into the provided box, and the system will automatically inform you if this username is available in the system--a green check mark icon to the right of the box along with green text below "Good News! YOUR ENTERED USERNAME is available--or if it is not available--a red minus (-) icon to the right of the box with red text below, "YOUR ENTERED USERNAME is not available." Your user name must have at least 6 characters, and no more than 30 characters. You can use alphabetical, numerical, the underscore (_) or dot (.) characters in your user name. Once you have found a user name that is available in our system, click Continue to create your new user name. The system will then create your new user name and then unlock the app specific configurations based upon your Zoho SalesIQ portal and user name. Each user of your Zoho SalesIQ who wishes to link their mobile devices to their account will have to create a user name and apply the user name specific configurations to be able to chat with customers. 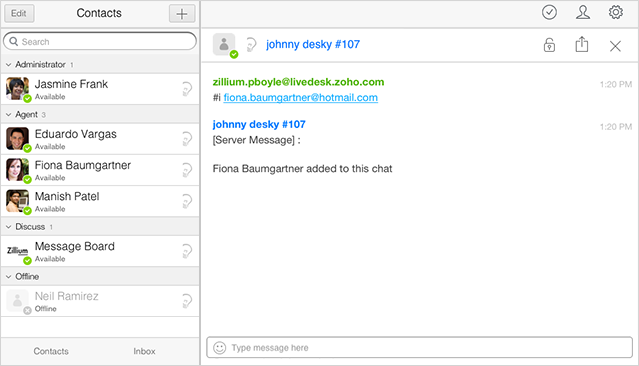 Because Zoho SalesIQ is built on the Jabber/XMPP protocol, you have the freedom to use any chat application that supports the popular standard. Below (and at the Zoho SalesIQ Jabber Configuration page) is a suggested list of popular apps that support the Jabber protocol for each popular mobile operating system. This is by no means an exhaustive list; as other apps support the protocol, which you can explore a more complete list of clients that support the XMPP protocol. Before you can configure one of these apps to link to your Zoho SalesIQ, you will first need to download the app to your mobile device. On your Android device these apps are available in the Google Play store. On your iOS device, they are available in the App Store. Once the app is downloaded and installed onto your device, you will need to configure the app to link with your Zoho SalesIQ account. In each application, you will first need to configure a new Jabber account and direct the app to look to your Zoho SalesIQ. The specific information for the suggested apps, pre-populated with your user name and portal details are available at the Jabber configuration page. 1. Select Jabber as the new account type. 3. Enter your Zoho account’s password into the password field. Below you will find the instructions for linking your Zoho SalesIQ to a few suggested apps on different mobile platforms. Follow the exact configuration steps for each app-specific configuration. These same details can be found pre-populated with your portal name and Zoho user name at the Jabber configuration page. After downloading and installing the apps listed below, follow the steps to add your Zoho SalesIQ account and start chatting with customers. Go to IM+, Select Jabber from the list of protocols. 1. Launch IM+, Click Add new account on the accounts tab. Sign in using your Trillian account. Go to settings, click accounts. Click Add, to add a new account. Enter the following details on the configuration page. Select Jabber after you click Add Account. Select Jabber from IM Services. Go to Account type and select Jabber. 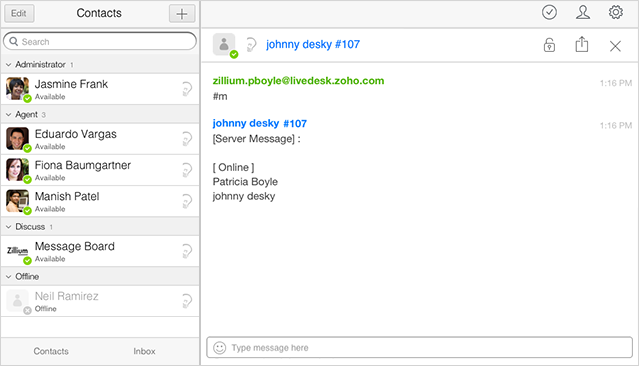 With Zoho SalesIQ you are also able to leverage the Jabber protocol and chat with customers from desktop chat clients. Take the ability to connect, chat and support customers from the chat clients you already use to collaborate and communicate with coworkers and friends—supporting customers can easily blend into the existing way you work. 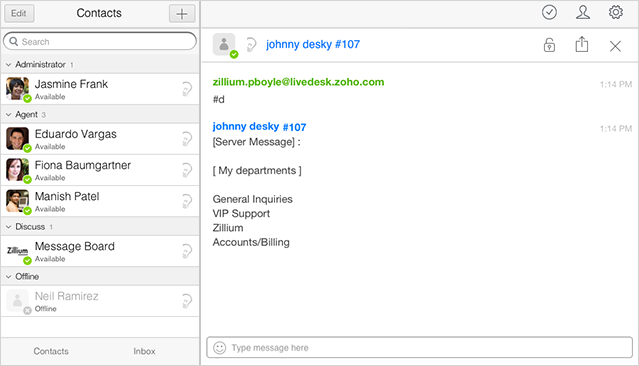 Find the exact details for configuring suggested desktop chat clients to your Zoho SalesIQ at the Jabber desktop configuration page. Now that your app is linked to your Zoho SalesIQ you can start chatting with customers from your mobile device wherever and whenever. 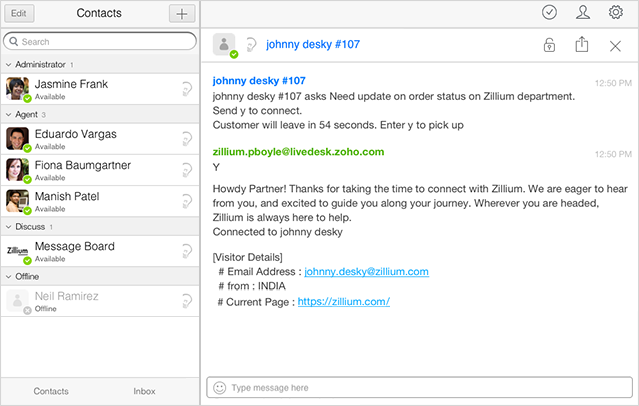 From your device, or desktop app you will see the incoming chat request pop up in your contacts or buddy list. Depending on your app configurations you might even get a push notification on your device of the incoming chat request. Here the system will display the visitor’s name, as they entered in your chat widget, along with their visitor number as their screen name, and with their status displaying what subject they entered in the chat request and what department they selected to connect to. 1. Select the visitor, by clicking or tapping on the visitor’s name in your contacts list. Or, in the case of an incoming push notification select the notification. 2. In the chat window that opens, type “y” into your chat input window, and send the message. This is a code that tells the Zoho SalesIQ server that “yes, I want to connect with this customer” and the system will automatically answer the chat and route it to your client. The system will automatically send you the visitor’s details including their name, their visitor number, where they are connected from (Country), the browser they are chatting from and their IP address. 3. Start chatting as you would from any chat client, by typing messages on the onscreen keyboard and then hitting “Send” from the client to enter the message into the live chat. To unlock further power through your Zoho SalesIQ from your mobile devices, use the interactive chat window to perform commands that give you added functionality from wherever you are. 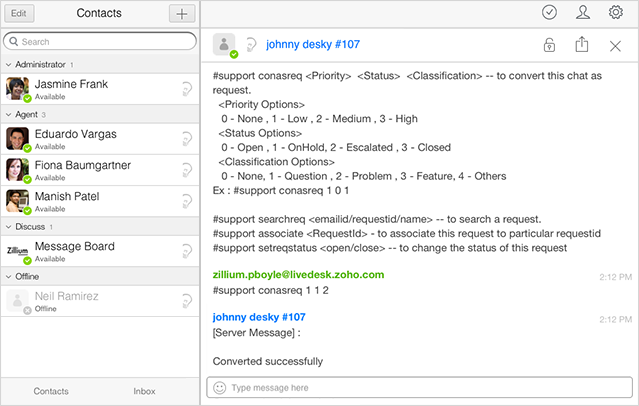 These commands give you access to the tools you use from your Zoho SalesIQ browser app to deliver answers to your customers. At any time you can view a full list of commands directly from any chat by typing #help, and the system will automatically send you the list of help commands. All commands are preceded by the pound symbol [#], which is a marker to the server to run a command instead of sending the message to your customer. Sometimes you need to take a break, or know a teammate who is better equipped to help out a specific customer. In these instances, even from your mobile devices you have the freedom to transfer a chat to a colleague. When you decide to transfer a chat, you must enter the transfer command. Enter #t, followed by the e-mail address of the agent you wish to transfer the chat to. There needs to be a space before the agent e-mail. Then insert another space and type a message to the agent you want to display to the agent you are transferring the chat to. Hit send to enter the command into the message, and the server will perform the transfer command. When you decide to transfer a chat to other department, you must enter the transfer command. Enter #t, followed by "<department name>" Then insert another space and type a message <notes(optional)> to the agent you want to display to the agent you are transferring the chat to. Hit "send" to enter the command into the message, and the server will perform the transfer command. If another agent transfers a chat to you while you are on a mobile client linked to your Zoho SalesIQ, you will see a new chat pop up in the client from the visitor’s name, and a server message will be displayed, detailing who transferred the visitor to you. The message will also say, “Send y to connect, n to ignore” and will display below the notes the agent sent along with their transfer. Answer the chat transfer as you answer a new chat from the mobile device, by typing “y” into the message window and submitting it. If you choose not to accept the transfer, enter “n” into the message and submit. Either way, the server will respond and either connect you to the transferred visitor, or reject the transfer. Sometimes you don’t want to transfer a chat, but you do want to reach out to another agent for help with a specific visitor. In these cases you can leverage the ability to invite another agent into the live chat, where you can then support the customer together as a team. 1. From the chat window, type the command “#i” followed by a space and then the agent’s e-mail address. 2. Add comments to the agent you are inviting by adding them after another space, “join me in helping out this customer”. 3. 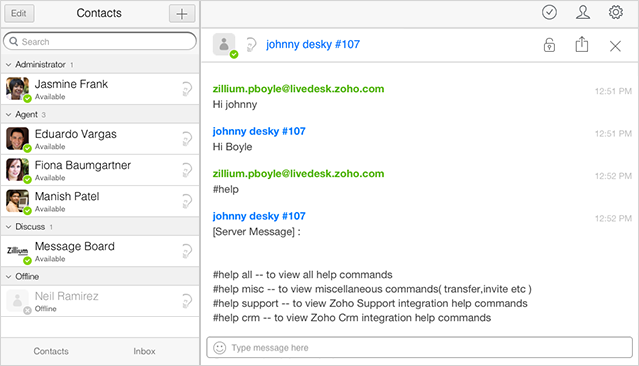 Send the command, and your Zoho SalesIQ server will send the invitation to the other agent. You can view more information about the visitor you are engaging with, including the visitors e-mail, country, web browser, operating system and the page they launched the live chat from. 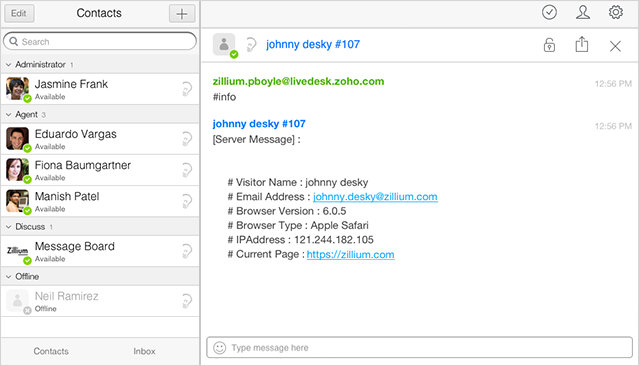 Enter “#info” into your chat window and you can see all the visitor information. If you happen to answer a chat from your mobile device and encounter either a spammer or someone harassing you, you still have the ability to block that visitor from their IP address. From the chat of the visitor you wish to block, type “#b”. Include comments about why you blocked the visitor after the command and a space, (ex. “this visitor was a spammer”). Send the message, to command the server to IP block the visitor. When you are chatting with customers, even from your mobile devices, you still have the ability to add notes to your Zoho SalesIQ with the information and insight you are gaining from chatting with customers. Type in the command, “#an”. After the initial command add the notes you want to include [Customer Steve Taskerson has been thinking about adding another portal to his Zillium account]. With the full command and your note text included in the tag, send the message, to have the server add your note into your Zoho SalesIQ. So you can provide the best possible support to each customer, in the context of their needs and culture, you have access to detailed information contained in your Zoho SalesIQ from wherever you are. Using a simple code in your mobile live chat window you can view existing notes about a customer inside your Zoho SalesIQ. Type in the command “#n”. Submit the command, and the existing notes added will be displayed, including the details of the note—such as when it was added (date and time), which agent added it, and the content of the note. 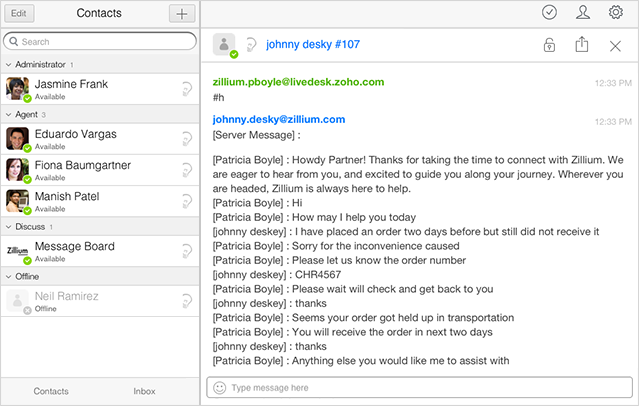 Get a quick recap of where a chat stands and catch up to a customer so you can deliver the answers they need quickly. Any time you are transferred or invited to a new chat, you are in the dark about how the chat is going and what the customer needs. 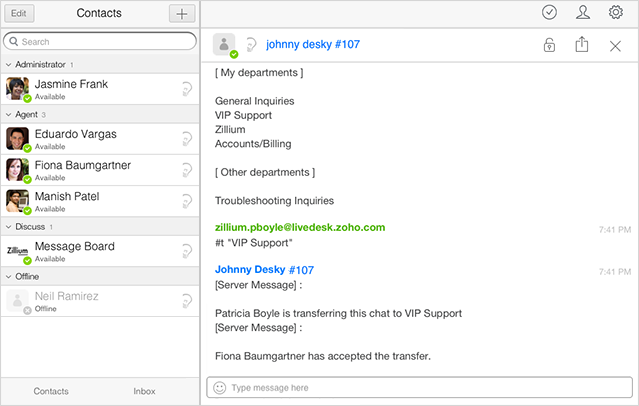 By running the view transcript command, you quickly get caught up with the chat and can jump in with the customer. Type in the command “#h”. Submit the command into the chat, and the transcript of the latest chats with the current customer will be displayed within your mobile chat window. 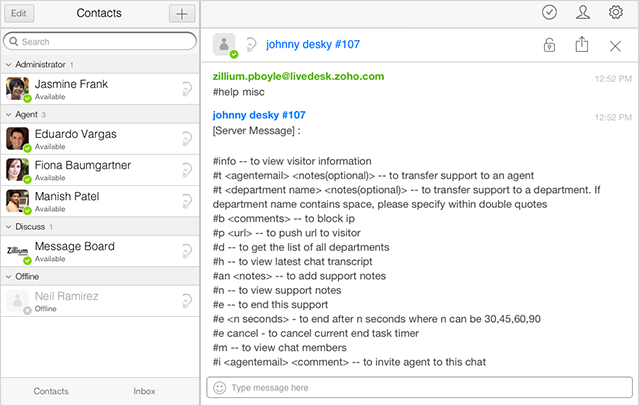 Each message from the transcript will be displayed as a new message in your chat window, and the beginning of each will show which participant was chatting inside brackets—since inside your window the client will display all messages as from the current visitor. Even from your mobile device, be aware of your team’s organization and quickly view all of your departments from inside a mobile live chat. From a mobile chat window, type the command “#d”. 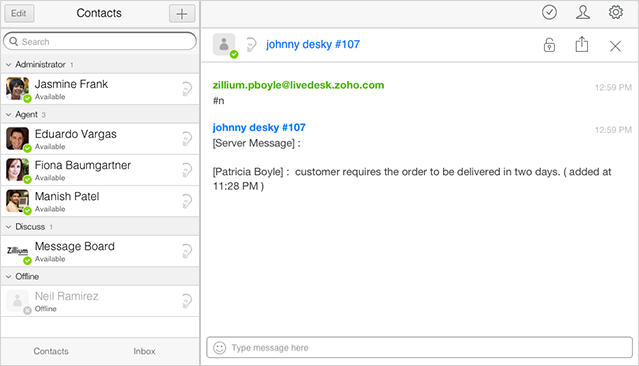 Submit the command into the chat, and the system will provide you a list of your departments from your Zoho SalesIQ in the window as a message. Share a helpful link directly to a customer, even from your mobile device. With the ability to push a link to a customer in a mobile live chat, you can still provide the high-touch customer support your customers are used to. From the desired mobile chat window, type the command “#p”. After the command, add a space and then type the URL of the site you want to push directly to your customer’s browser [ex. https://taskerpro.cleaning.zillium.com]. Submit the full command with the URL into the chat, and the system will push the page to your customer and open in a new window, if they choose to accept (A dialogue will pop up in the window they are using to chat with you asking them if they would like to open the page you shared in a new window). Get quickly updated with a group chat you were just invited to, and see who is all involved in a chat. From the desired chat, type the command “#m”. Submit the command into the chat, and the system will generate a message displaying everyone who has been a member of the current chat, and display them by their current status, whether they are online or offline. Like from the browser app, from mobile chats you have different options for ending chats with customers. You can end a chat immediately at any time or you can set a chat to end after a defined amount of inactivity from the visitor. From the mobile chat window, type in the command “#e”. Submit the command into the chat and the system will automatically end the chat. From the mobile chat window you wish to set the timer on, type in the command “#e” followed by a space and the amount of seconds you wish to set the timer for. Choose between 30, 45, 60, or 90 seconds, and enter the number you wish. Submit the full command with the defined time period into the window, and the system will start the inactivity timer, you will see the message, “Support will end in X seconds.” If the visitor is then active, the timer will stop and you will see the message, “End support interrupted.” If the defined time passes, the system will automatically end the chat. While a timed end command has been applied, you can manually cancel this command by typing “#e cancel”. 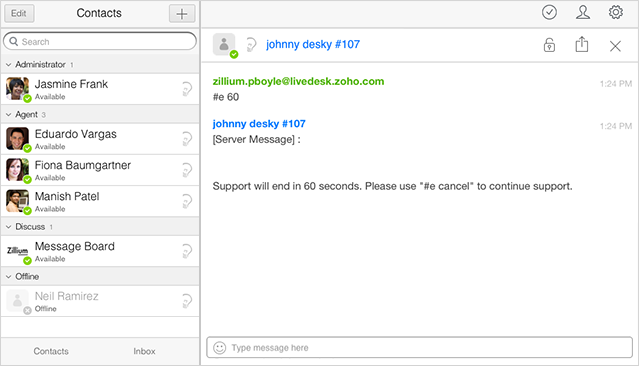 Submit the cancel command into the chat, and the system will cancel the pending end countdown. Chat support is successful when teams collaborate together and push each other to new heights. We built Zoho SalesIQ to bring your team together and elevate your customer support, so we made it easy to stay connected with your fellow agents even when away from your Zoho SalesIQ browser app. From your mobile chat client you will see your fellow agents available to chat with their name (and even profile photo) in your contacts or buddy list. You can use the chat client as you would with any other chat platform, and communicate and collaborate with your colleagues. 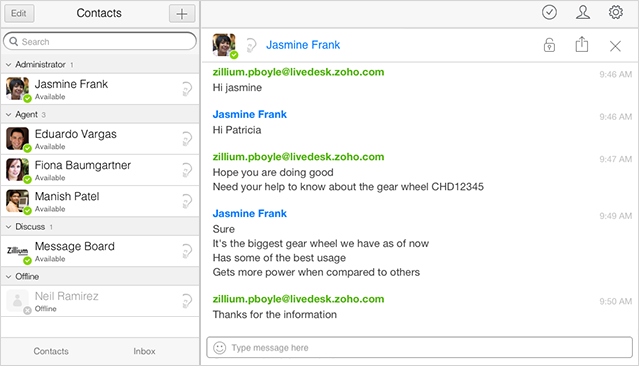 Whenever you want, snap over a message to a teammate, whether you need their advice, or need their help finding you the exact right resource, with Zoho SalesIQ linked to your mobile chat clients you have complete-collaborative power. 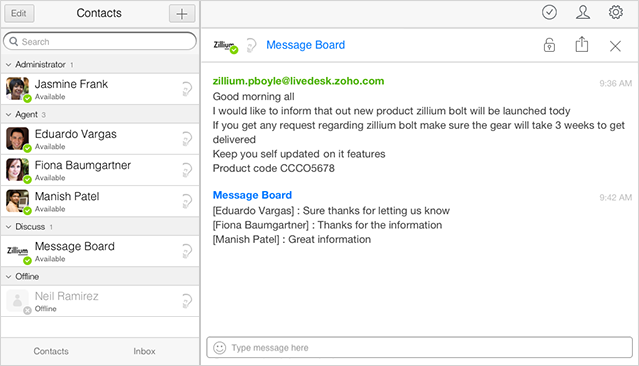 The other option you have with your Zoho SalesIQ for collaboration is to use your portal-wide message board to share updates and information with everyone. This too is available from your mobile chat clients, and will be listed as another contact or buddy. Open up the message board as you would a chat, and enter the message you want to share with your whole team. When your manager or teammates send out updates, you will receive the updates, wherever you happen to be. With the features you use to work together in Zoho SalesIQ accessible from anywhere via your linked mobile clients, your team has the complete freedom to scatter—and yet still thrive. 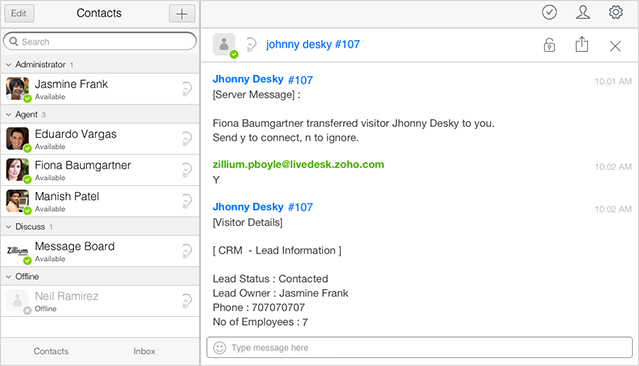 Get a more detailed view of the visitor you are chatting with by easily accessing their details from inside your Zoho CRM account. 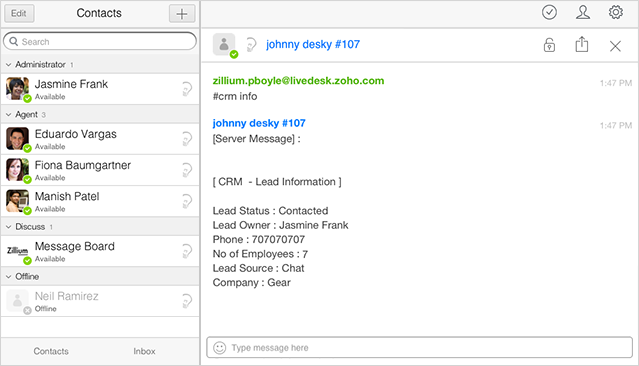 When you have your Zoho SalesIQ linked to your Zoho CRM account, you can quickly view a visitor’s details from your CRM inside your mobile live chat. Type in the command “#crm info” into the chat window you wish to pull the CRM info for a visitor. 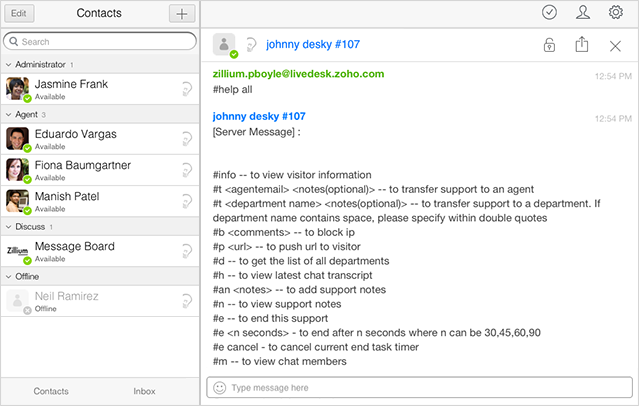 1.Type in the command “#support info” into the chat window, if you wish to pull the Support info for the visitor. 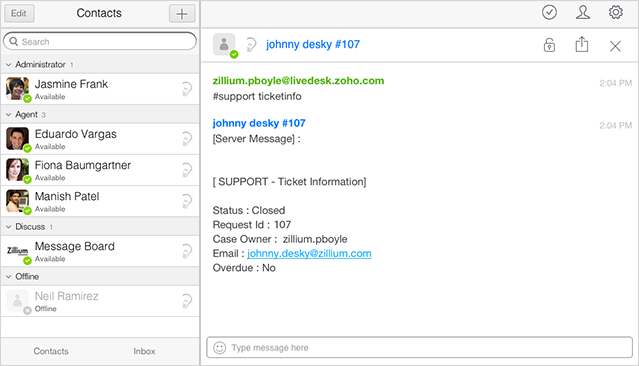 1.Type in the command “#support ticketinfo” into the chat window, if you wish to pull the Support info for the visitor. 1. 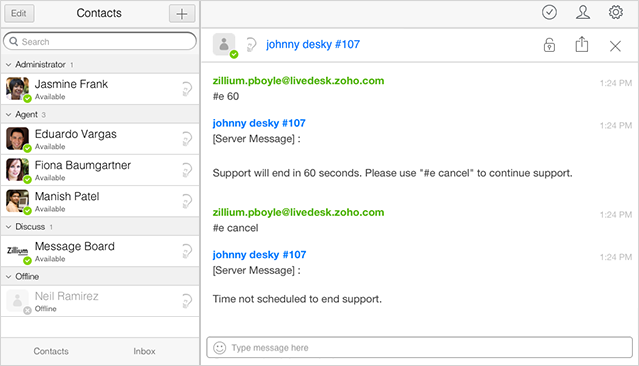 Type in the command “#support recentreq” into the chat window, you would like to pull the Recent request of the visitor. Do you need to convert the chat to request at any time of during the chat? just type in the command “#support conasreq” into the chat window. However you have to set the status to “Choose on Demand” in the support integration department settings to convert a chat to request on need. 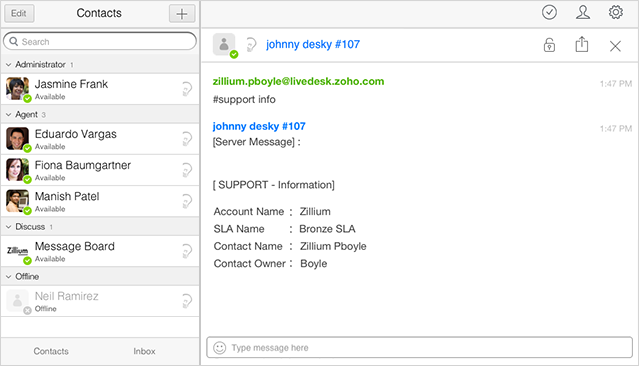 While chatting with, your agents can also search for tickets from Zoho Support by visitor name, ticket number and visitors email address. 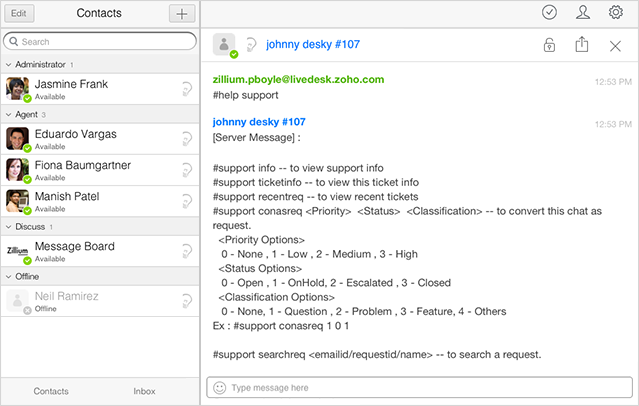 Just enter “#support searchreq“ followed by <emailid,ticket id,name> into your chat window to search for the existing tickets. When a customer starts a chat with you and if you are clear, as they are asking for the same existing request, you have the ability to merge the new request with the existing. While chatting, just enter “#support associate <Ticket ID>” this will associate the new with the existing one. 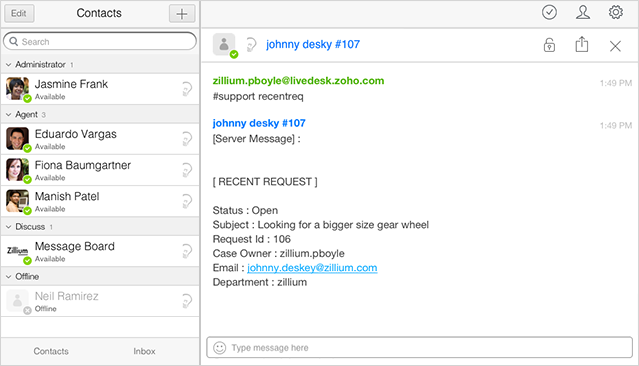 Also while chatting, your agents can open or close related Zoho Support requests from Zoho SalesIQ. Lets say you are chatting with a customer and came to know that his password has not actually been reset. So instead of creating another request, you can re-open the associated request you see in the sidebar and ensure the task gets taken care of without the mess of redundant requests. Enter “#support setreqstatus <open/close>” in your chat window to change the status.